Unravelling the incredible lives of the most gentle ocean giants. Details on the full "Secrets of the Forest" article, published recently in UwP Magazine. 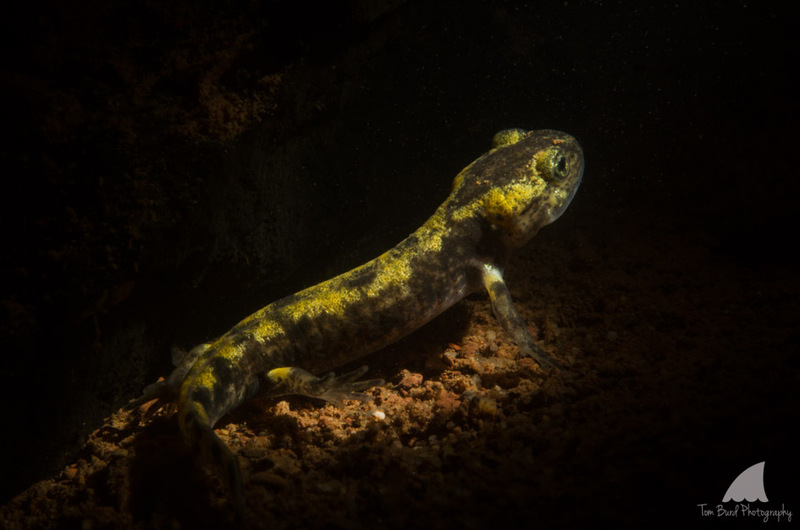 At the bottom of the fall lies a shallow pool only a few meters wide, which happens to be an annual breeding pond for all sorts of marine life, but most interestingly for fire salamanders (Salamandra salamandra)! Armed with a broken camera I attempted to take photos of them, but with little success. A year later I have returned, with a little more experience and a vision of the type of image that I wanted to produce. First of all though, a little biology. Fire salamanders have two life stages but spend most of their time on land, hiding most commonly under leaves and wood on the forest floor. They are primarily active at night, feeding on insects, worms and slugs depending on the species of salamander. During mating season in early spring, a spermatophore is transferred from the male to the female, fertilising the female’s eggs internally. Returning to the water a few months later, females will then lay directly into the waterbody where the larvae are left to fend for themselves. 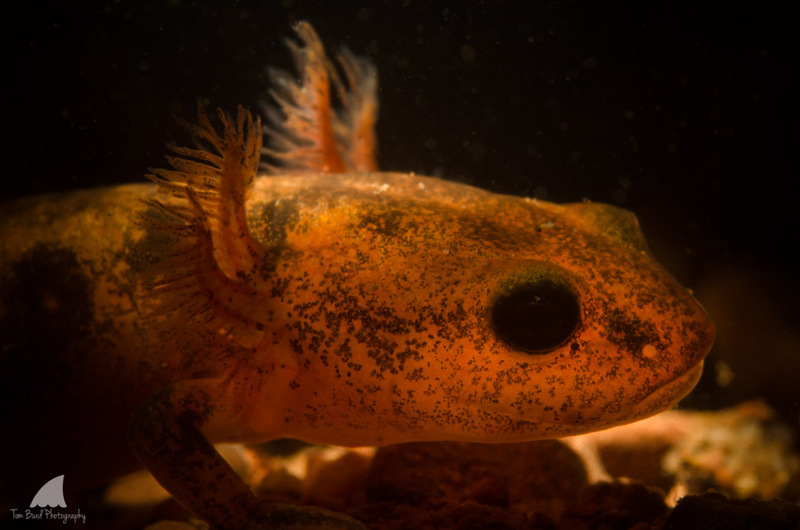 At this point the juveniles are specifically adapted to an aquatic lifestyle; gills protrude from their neck, allowing dissolved oxygen in the water to be absorbed. After about one month of being water babies, it’s time to head for land as the gills start to slowly disappear! At this point, I have noticed that the colouration starts to become more prominent, as the characteristic fiery-orange patterns begin to cover their skin. I wanted to emphasise this incredible feature of the larvae (the gills), and I knew that the brown sediment in the background of my previous photos was very dull. Having heard a bit about using “snoots” in the past, it sounded to be the answer to my problem. Snoots are basically funnels which reduce the coverage of your flash, creating a thin directional beam of light. This would allow me to highlight only a small portion of the animal, whilst creating a more pleasing black background. Problem solved? 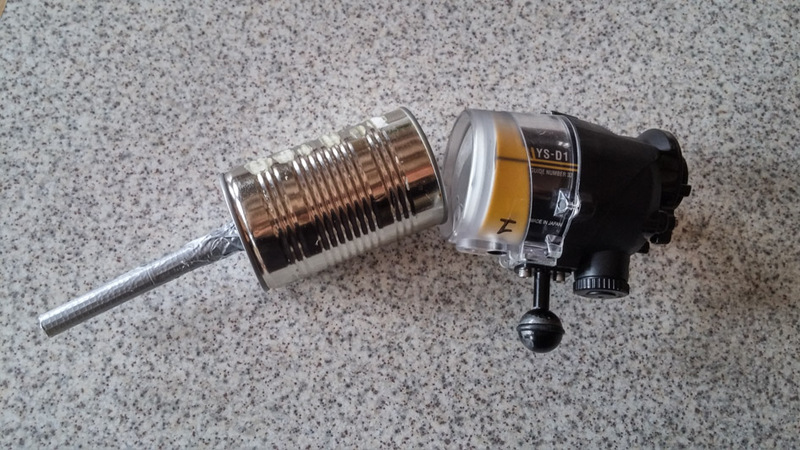 Well it turns out underwater snoots cost an arm and a leg, so I decided that it was time to do a bit of DIY. Drum roll please for… the baked bean tin! With a hole drilled in one end, I inserted a thin plastic pipe 1cm in diameter, held in place with Gaffa tape (the solution to most problems in life!). A touch more tape and it was attached to the front face of my strobe and ready to go. 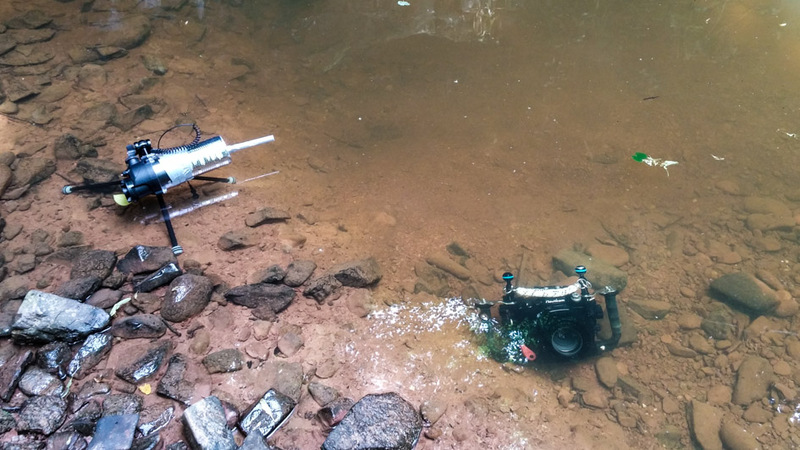 The problem with using a snoot is that you are trying to aim a minute beam of light onto an even smaller object, all of this whilst floating in a shallow pool of water, trying not to stir up sediment and not scare away the salamanders! They are very sensitive to vibrations and were particularly uncooperative, turning away from the camera at any opportunity. I think it also didn’t help that a grass snake was swimming around me, and the salamanders wisely decided not to stay still for too long! 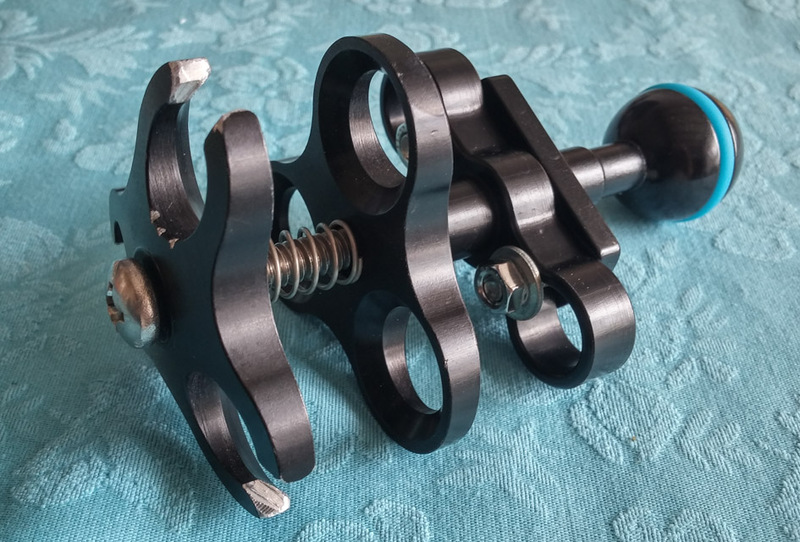 Following the advice of snoot guru Keri WiIk, I mounted my home-made contraption on a tripod of strobe arms (modifying a triple clamp that I had purchased previously). 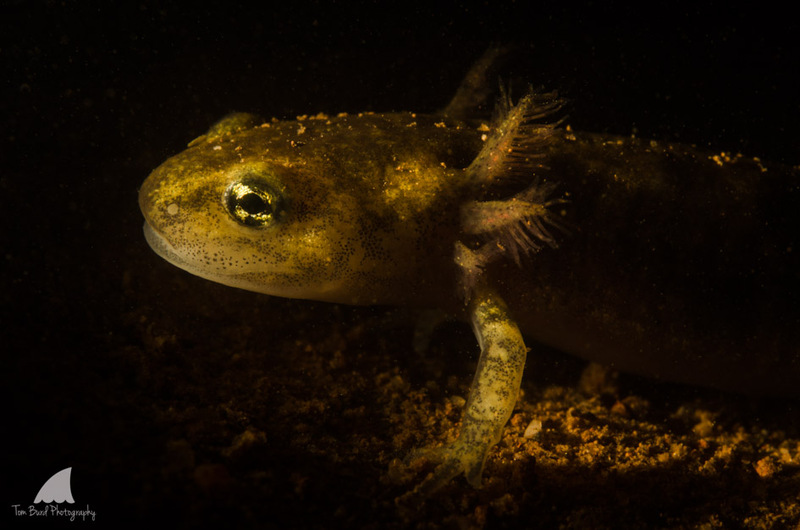 This allowed me to position myself freely around the ever moving salamanders, direct the light beam and then alter my composition accordingly through the lens. Altering the distance of the snoot from the subject changes the diameter of the beam and therefore the entire feel of the photo. Not easy stuff at all, but I am quite pleased with my first attempts over the past few days, considering how fast a salamander can shift when it wants to! -Don’t stress the animals, never touch or harass them into a different position. Take a few photos and move on to another individual to avoid potentially damaging their eyes. Remember that they couldn’t care less about your Facebook “likes”; their welfare comes first! -Do your research first, make a plan and stick to it. This helps avoid accidents, often to the detriment of the animals. -Think of what products you are using on your body or equipment, which if not biodegradable, which could harm the ecosystem that you’re entering. No sun cream, hair gel, talc power for getting into dry suits, WD40 on any camera kits etc. 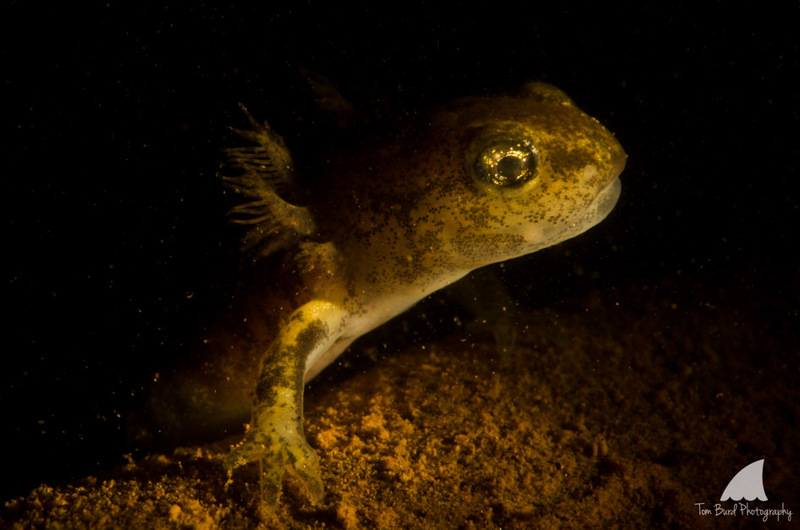 Salamanders in particular are very sensitive to even small levels of toxins, but this should be a general rule for diving. Eco alternatives available here at Stream2Sea. -As when visiting anywhere, leave it as you found it. Don’t move rocks around to sit on, or leave any rubbish behind. I hope you’ve enjoyed the series of photos and that they create some enthusiasm for herpetology (the study of reptiles and amphibians). As with all things, create enthusiasm for an animal and people will want to save it! 1/3 of all amphibians are threatened with extinction (IUCN, 2004), so they really are in dire need of a helping hand. Subscribe for email updates and get a FREE clownfish desktop wallpaper! Make life easy, I'll let you know when any new posts come out. I respect your privacy, you'll get no spam from me! You should receive an email shortly with a link to confirm your subscription. Click HERE to download your FREE wallpaper. Feel free to read my older posts, visit my Facebook page and follow me on Twitter. What NOT to do with a Weedy Sea Dragon! As divers we are ambassadors of the oceans, but how can we protect them if those leading our sport do not teach respect? With 14 dives under my belt in the past 5 days, I’m taking a short break at the surface to share a few photos and stories with you, live from Dahab. On the South-East coast of the Sinai Peninsula, this relaxed bedouin town has developed a dive industry over the past few decades, whilst managing to maintain a traditional atmosphere. To those looking for a chilled diving holiday, this is certainly the place for you. The first few dives were literally just outside of the dive centre: Poseidon Divers, run by British ex-pat Jonpaul and his awesome team. Jonpaul himself is an underwater photographer, which was my main reason for choosing to dive here, as he understands the need of small dive groups and puts emphasis on diving slowly. In my opinion a single dive like this is equivalent to 2 or 3 rushed dives with other companies, especially for photographers who are wanting to try out different techniques or use new equipment. I can definitely recommend them. I was casually told that at the dive sites of Mashraba and Bannerfish Bay, we might get the chance to see seahorses! Having briefly glimpsed one over 5 years ago, this was an extremely exciting prospect, so we set off on the hunt. The bay outside the centre just happens to be the perfect habitat for these enigmatic creatures, being primarily covered in sand and seagrass. After 15 minutes of slowly scouring the grass for any sign of those elongated snouts, spiny backs and curly tails, I surprised even myself by stumbling across a truly beautiful specimen! Around 15 cm tall and deep purple, with speckles of colour along the spines, it was obvious this incredible little animal was studying me curiously. As I watched him closely, his delicateness was astounding and I also noticed that he was heavily pregnant. Yes, I did mean to say “he”! Surprisingly, female seahorses deposit the fertilised eggs into a special abdominal pouch on the male, who then takes care of them until birth! The pouch is vascularised, providing nourishment and oxygen to the young in a safe environment. It’s not often in nature you see the guys doing all the hard work! Most seahorses mate for life though, which is probably why the males put in a bit more effort.. Check out this video to see tiny seahorse larvae being born! Over the course of the next few days we saw no fewer than 9 seahorses including white, black and green individuals (Hippocampus jayakarai and Hippocampus suezensis), thanks to the keen eye and patience of my guide Hamada! They are particularly tricky to photograph, tending to shy away and turn their back to the camera. 1. Keep in mind that you are a very large and powerful object, trying to get up close with a very delicate creature! 2. Establish your buoyancy and have a plan before approaching. 3. Don’t use excessive flash, which could potentially harm their eyes and reduce their fitness. (Whether flash actually harms animals is a much debated topic, as nobody really knows, but I tend to be cautious anyway. We are visitors in their environment after all, and our photographs certainly aren’t worth risking any harm to them). Try to shoot in shallow water using natural light if possible, if not then set your flash to very low power and take only a few shots. Also remember that you are not the only diver out there, at a busy location the seahorse could get a good few visitors every day, so limit your interaction with it to a sensible length of time (this goes for all marine life in my opinion!). With over 400 species worldwide, it is very easy to fall under the charm of their grace and charisma. Unfortunately however, seahorse populations are in serious decline worldwide, due to habitat destruction and a growing annual harvest. Over 20 million are taken from the seas globally each year, primarily for the Asian medicine markets but also for the aquarium trade. Please never purchase seahorses in any shape or form, just enjoy their beauty through these photos, or get out searching for them yourselves! Please help me to keep writing interesting articles for you by using these links when you make purchases on either Amazon UK, Amazon FR, Amazon IT, or Amazon ES. It costs you nothing, and you can use the links at any time to buy absolutely anything on the site in each country. Thank you so much, it's greatly appreciated! Announcing the release of my article on shark diving in South Africa, in the world's longest running online magazine: UwP. A quick step guide to capturing incredible water droplet photos.